Lexus' LF-CC coupe concept will become the RC 350 when the production version is unveiled in November in Tokyo. It will be powered by a 3.5-liter, 306-hp V-6 engine. Lexus has a reputation for great quality, but it doesn't get much credit for personality. Toyota's luxury arm will try to reverse that by adding a slew of sporty new models in the next few years. It also will jazz up its engine lineup -- following the Audi and BMW example -- by offering a 2.0-liter turbo engine in entry-luxury vehicles and as a base engine for mid-sized vehicles. The turbo is expected to be in the 250-hp range. Lexus also is expanding into the compact crossover segment. 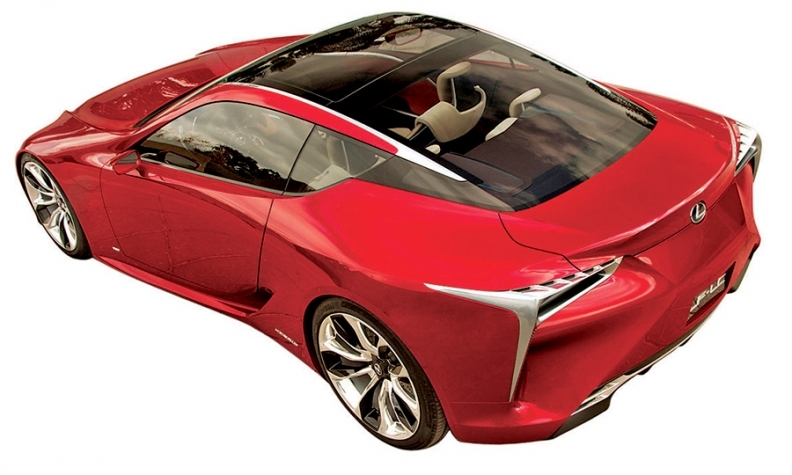 Here is a look at Lexus' future product plans. CT 200h: A freshening for the 2014 model year includes more telematics features. No major changes are planned until a spring 2016 redesign. The CT 200h will remain a hybrid-only offering; no turbo version is planned. IS: The sedan was re-engineered this summer. One possible mid-cycle change in mid-2016 would be the addition of a 2.0-liter turbo with an eight-speed dual-clutch transmission to replace the aging 2.5-liter V-6 as the base engine. The IS-C coupe goes away with the introduction of the RC nameplate. ES: Re-engineered in summer 2012. GS: Re-engineered in spring 2012. LS: Re-engineered in summer 2012. RC: The LF-CC coupe concept from the 2012 Paris auto show will become the Lexus RC 350 when unveiled in production form at the Tokyo Motor Show in November. It will use the IS/GS platform and will be powered by a 3.5-liter, 306-hp V-6 engine. The high-performance RC-F version debuting at the Detroit auto show in January will have a 460-hp V-8 under the hood, which Lexus hopes will steal sales from the BMW M3. track to arrive in late 2015. 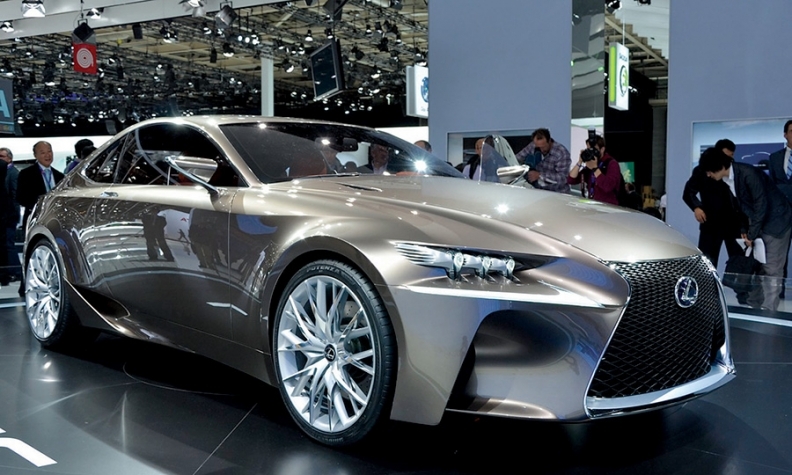 LF-LC: After its rave reception at the 2012 Detroit show, Lexus' flagship coupe concept received a green light from CEO Akio Toyoda. This 2+2 hybrid-powered coupe, which is likely to cost about $120,000, will be more akin to a high-performance LFA lite than a successor to the portly SC coupe. Toyoda has fast-tracked it to arrive in late 2015. LFA: Lexus built 500 of the supercars for worldwide consumption, but its run is done. No convertible version is planned. NX: A smaller global crossover vehicle derived from the RAV4 platform will compete with the Audi Q3 and BMW X1. Toyota applied for a trademark for NX 200t and NX 300h, which points to a 2.0-liter turbo and a hybrid with the equivalent power of a 3.0-liter V-6. The turbo will arrive first in the fall of 2014, and the hybrid will arrive early in 2015. RX: Last summer's midcycle sheet metal freshening was so dramatic that Lexus pushed the RX redesign to 2015. The RX's five-seat Camry/Avalon-based footprint will stay the same because it will be a global model. To pacify European and Japanese clients, a turbo-four engine will be offered, although maybe not in the United States. GX: The 2014 midcycle freshening for the truck-based SUV includes a trapezoidal fascia and more telematics, although there will be such cost-cutting measures as manual third-row seats. The GX will be removed from the lineup in the fall of 2016 to make room for the car-based TX. TX: Talk about missed opportunities. It has been 10 years since Lexus unveiled the HPX seven-seat car-based crossover concept at the New York auto show -- and we'll wait at least three more years to see a production version on public roads when it arrives in late 2016 or early 2017. Toyota has applied for a trademark for the TX nameplate. Toyota is secretive about whether the TX would use the RX-Avalon front-wheel-drive architecture for packaging benefits or use the IS/GS rear-wheel-drive architecture for a sportier feel. LX: Because the incremental volume and huge profits of the top-line SUV helps justify Toyota's investment in the Land Cruiser, the LX won't go away. Expect a stretched cycle, well beyond the normal seven years, to at least 2016.